Death Metal band PLEURISY employed two lead vocalists, Johan Wesdijk credited with 'screams' and Mathieu Van Hamersvelt for 'grunts'. The group debuted in 1993 with the five track promo tape 'My Favourite Girl'. 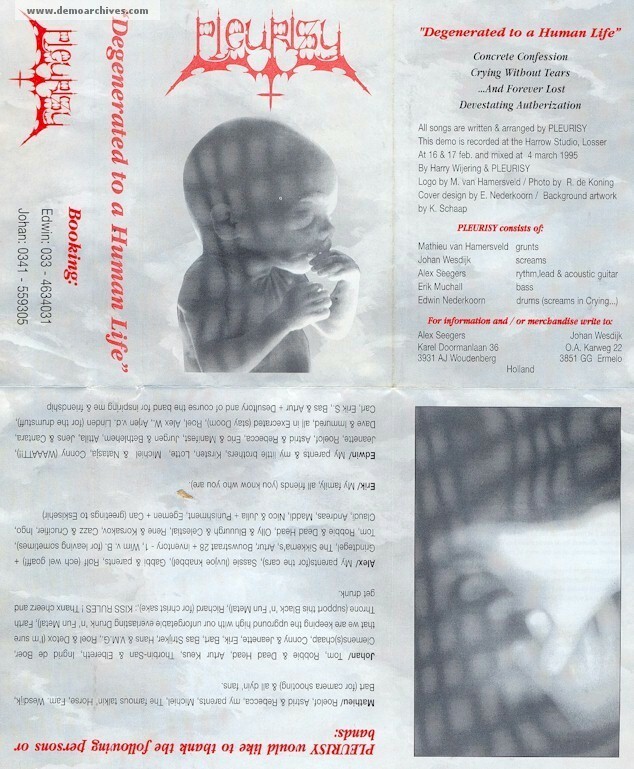 A further cassette 'Degenerated To A Human Life' followed in 1995, tracks from also surfaced on the EP 'Unholy Spheres'. That same year guitarist Axel Becker, in collusion with ORPHANAGE members bass player Eric Hoogendoorn and Poldermann founded a side project SILICON HEAD. Pro printed covers and tapes. Lyrics on back. Cover folded out to A4 size.